Yahoo™ Notifier Pro is the easier way to check your Yahoo Mail! "Yahoo™ Notifier Pro" integrates Yahoo Mail into your Firefox or Opera browser by providing a convenient toolbar panel to browse your emails. The panel loads mobile version of Yahoo Mail web client. You can use it to read your incoming emails without the need to leave your current tab. Yahoo™ Notifier Pro on Firefox does not seem to work anymore. How can I fix this? See the version history page at the Firefox add-ons site for details about this update. What are the known limitations of this extension? The extension still does not support multiple user logins and there is no desktop notification at the moment. I will consider adding these two features in the near feature. What is Yahoo mail service? Yahoo Mail is a free email service (except for Yahoo Mail Business Email Plans) offered by the American company Yahoo!. For more information about Yahoo Mail visit here. What is the number appears in the right hand side of the toolbar button? How can I get badge notification updates? Yahoo™ Notifier Pro does not store your credentials. To get badge notifications, you have to be logged-in into your Yahoo mail account. 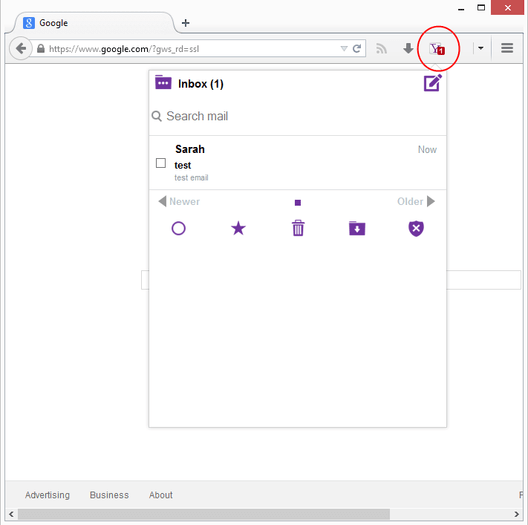 Simply, open a new browser tab, and go to your Yahoo mailbox. As soon as the login process is over, the notifier detects your account and updates its badge number accordingly. There is no need for the browser tab to remain open after a successful login. Yahoo™ Notifier Pro uses browser cookies to keep the badge number up-to-date.